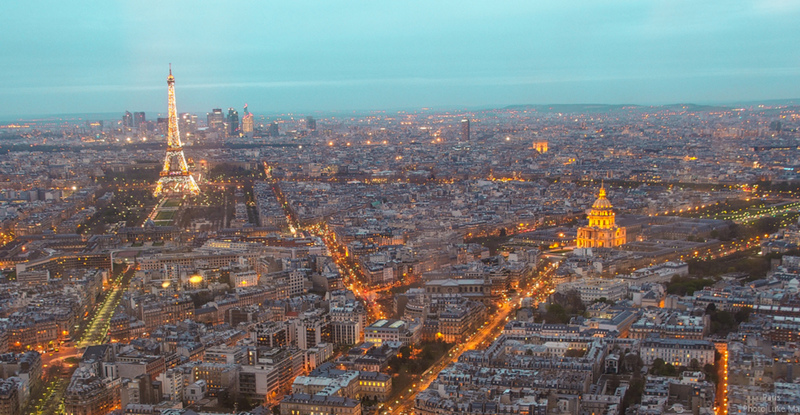 Assuming no last minute collapses in form or bone-breaking crashes, Chris Froome will ride along Champs-Élysées on Sunday as the winner of the 2015 Tour de France and the only British man in history to win the race twice. This was achieved in a Tour characterised by high speed crashes, the throwing of urine and abuse at Froome, reports of a data hack into his Sky team’s files to cast doubt on the legitimacy of his success, and a spectre of doping that refuses to leave the mountains. Then of course, there is the small matter of 3,400km of bike racing against highly motivated rivals. Victory in this most brutal test of human endurance is within reach, but what explains why Froome chose to push his body so hard in pursuit of success? Is he just that rare breed of cyclist who can excel on the flat, in the mountains, and in team and individual time trials? Or, is there something else more elusive that shapes a champion? The narratives that elite athletes construct and detail in their autobiographies are becoming an established source of data for scholars who seek access to the underlying identities of elite athletes to understand a champion mindset. Froome’s autobiography The Climb gives us useful look at how he has constructed his narrative. Froome depicts his passage from being a skinny kijana (youngster) racing his mentor in the Ngong Hills in Kenya to triumph in the 2013 Tour de France. His story comprises a number of intertwined narratives of which the most dominant is a performance narrative. The term, coined by Kitrina Douglas and David Carless, involves a single-minded dedication to sport, and the prioritization of winning above all else that might impact on the athlete’s mental well-being, identity, and self-worth. In addition to being dominant in Froome’s memoir it can be seen as the prevailing narrative in other autobiographies, such as that of Olympic champion Michael Phelps. Froome’s performance narrative is framed by accounts of suffering. In fact, his repetitive use of the word reminds the reader that suffering, particularly on his bike, is what characterises his life. His Kenyan birthplace is known for its world class runners but has had little success in cycling. What it also has is mountains, and it is in these mountains that Froome developed his highly focused resilience. As onlookers we have seen his single-minded motivation, against the odds, towards becoming a multiple Tour winner. His resilience is evident in the face of pretty much relentless doping insinuations in the French press and particularly through social media, as well as in his response to urine being thrown at him, and in the searing conditions of the Tour. It is in the mountains though where we get to see Froome’s solace in suffering. And perhaps it has been no better demonstrated this year than in the mountain finish at La Pierre-Saint-Martin when Froome attacked to gain more than a minute on all of his main rivals. We all experience adversity, and champions are no different, but perhaps it is their response to the distress and disappointment that provides the transformational processes that motivate them beyond mere coping. This is apparent in many sporting autobiographies such as in the memoirs of Olympic swimming champions, Amanda Beard and Ian Thorpe, where adversity and the positive outcomes, framed as “adversarial growth”, are central. These accounts tend towards a more quest-focused narrative which involve the confrontation of adversity, seeking of meaning, an explicit drive to gain something positive from the adversity, and a rejection of the performance narrative. Froome’s story involves adversity and despite the lows he achieved ultimate success. Froome recounts harsh school conditions, illness (bilharzia), his mother’s death in 2008 while he was riding in Spain, and the frustrations of 2012 when he was assigned the role of domestique for Bradley Wiggins, nurturing his team leader through the stages to Paris (with only the odd false step). Adversity was also evident in the build up to this second victory; a broken wrist in the 2014 Tour meant a stage five withdrawal and no replay of his 2013 glory. Unlike Beard and Thorpe though, Froome has never rejected the performance narrative, even if in modern cycling it contains its own dangers. It may be the primary device explaining Froome’s drive, motivation, and sacrifice for cycling, but there is a limit to the pervasive script of this narrative. Froome has consistently attempted to draw a definitive red line as to the limit of his performance. His team this week was forced to reveal power data which claimed to show estimates put forward by an expert were massive overestimates. In a sport damaged by the admissions of Lance Armstrong, it is a curious by-product that Froome and Team Sky are as eager to shout about both the normality and exceptionality of his performance. As Froome prepares to ride the remaining mountains on his road to Paris, we will be watching to see if that performance narrative will continue to produce the effort, sacrifice, and team ethic required for this and future tour victories. Karen Howells is Lecturer in Sport and Fitness at The Open University. This entry was posted in Karen Howells, Tour de France on July 27, 2015 by Caroline Heaney. Whilst there was scrutiny over why particular dance styles were selected over others, and why and how dance styles could be compared to each other, there does not seem to be a discussion about why there was such a lack of female representation on the show. During this discussion we don’t want to take credit away from the boys who made it through to the final, but point out the inequalities that existed from the way the program was set up. Firstly, let’s take a look at the female-male distribution of judges. Only 33% of the judges were female on the shows. Just 30% of leading dance experts was female who selected the grand finalists. For the final, just one female was placed on the judging panel. Dance is considered a female activity (Risner, 2009) so where are all these women at the top? For example, Arlene Phillips is a world-renowned director and choreographer, who is missing from these panels of experts. The BBC was accused of sexism and ageism when Arlene was taken off the Strictly Come Dancing panel. Indeed, figures show that older women are less likely to appear on TV. Additionally, why wasn’t Darcey Bussell on one of the judging panels; particularly in the ballet finalist? For Ballet these were the leading panel of experts: Dominic Antonucci, Ballet Master of Birmingham Royal Ballet and Christopher Hampson, Artistic Director of Scottish Ballet with Kenneth Tharp, chief executive of The Place, who judged across all categories. According to McPherson (2005), “men dominate executive, administrative, and artistic positions of nearly every ballet company in the United States” and women report feeling excluded from informal leadership and decision making networks ringing very true in the world of ballet. Instead of being held up as one of the leading experts in ballet, Darcey Barcell, CBE, former principle dancer of the Royal Ballet at 20years old and widely acclaimed as one of the best British Ballerinas was reduced to being the presenter of the show. Indeed, Williams (1992) argues that subtle forms of workplace discrimination push women out of male dominated occupations that involves decision-making. However, this is not just a problem with the BBC Young Dancer competition. In 2014, The Young British Dancer awards saw an all-male line up for the six available awards as well. It is well documented that males are the minority in dance education environments (Risner, 2007). Dance in the Western World is generally considered a female activity and so those boys who dance are considered effeminate and often assumed to be homosexual (Polasek & Roper, 2011, Risner, 2014). Risner (2014) has documented widespread verbal, emotional and physical bullying of young male dancers due to these constructions. Thus it is possible that boys who decide to attend dance classes, despite such bullying, are those who are skilled at dance and so the variance in dance ability and passion for dance may have much greater variance for girls than boys with boys being at the top range of the distribution. Furthermore, within the dance studio environment boys are nurtured and often receive preferential treatment compared to the girls and this may be in part to prevent boys from disengaging (Polasek & Roper, 2011, Risner, 2014). Stinson (2005) talks about how such privilege within, not just the studio, but also the dance world is accepted by both men and women and as such often goes unchallenged. Whilst female dancers are often encouraged to remain passive within the dance class and simply respond to commands, male dancers are often encouraged to participate more fully and challenge the passive position of student dancer as this enables them to reclaim their masculinity (Risner, 2007, Stinson, 2005). The combination of highly dedicated and skilled males who hold an elite position within the dance class and are encouraged to put themselves forward and challenge the status quo may explain the gender inequality in both the BBC Young Dancer finalists and judges. It is possible that young male dancers were more encouraged by their dance teachers to audition for the competition and were more confident in their abilities to take on such a challenge. This could explain the number of male dancers in the semi-finals since this is a higher proportion of male dancers than female dancers given that male dancers are a minority in the dance world. The valuing of male dancers, at the cost to female dancers, may also explain the gender inequality in the final contestants. This is not to say that the male dancers did not deserve to be in the semi-finals or finals; far from it. What we want is equally confident and privileged female dancers and a challenge to the inherent gender divisions within dance. Boys also need to know that they are achieving in dance because of their talent and not their gender. Boys need to come to dance unafraid of being bullied and without the fear of having their masculinity and sexuality under scrutiny; Russian boys and men don’t seem to experience this sort of discrimination. Girls need to come to dance knowing they will be as equally valued as boys and have permission to move from passive student to empowered dancer. Whilst it was a pleasure to watch all the finalists dance, we would like the gender imbalances in dance, for both males and females, to progress in a way that both male and female dancers feel valued for their abilities and skills. So then we are no longer distracted from such talent by the stark gender inequalities presented to us in such programmes as BBC Young Dancer of the Year. Risner, D. (2014). Bullying victimisation and social support of adolescent male dance students: an analysis of findings. Research in Dance Education, 15(2), 179-201. Stinson, S.W. (2005). The Hidden Curriculum of Gender in Dance Education. Journal of Dance Education, 5(2), 51-57. This article was originally published on The Psychology of Women’s Section Blog. This entry was posted in E314, Equality, Gender, Helen Owton, sociology and tagged Ballet, BBC Young Dancer of the Year, Dance on July 21, 2015 by Helen Owton. Seventeen swimmers, competing in front of a home crowd, will make up Team GB and comprises a number of world class athletes including multiple gold medal Paralympian Ellie Simmonds, four-time European champion Andrew Mullen, and Sascha Kindred who is competing at his seventh IPC Swimming World Championships. As the build up to the championships gathered momentum, there was a British upset with S14 Paralympic Champion, Bethany Firth being forced to withdraw after she fractured her wrist in training with just two weeks to go. Following the success of the London 2012 Paralympic Games an additional £8 million of National Lottery funding was provided to encourage more disabled people into sport. This has been partially successful with 44 projects, mostly at grassroots level, receiving funding to increase participation in sport. Last year Sport England identified that although the participation of disabled people in sport had risen, significant barriers still remain. In their evaluation of their inclusive sport programme, Sport England recognised that swimming was one of the most commonly cited sports that disabled wanted to take part in, but had as yet been unable to do so. The Paralympics in 2012 had a positive impact on the public perceptions of disability sport, but there is still more to be done. The most commonly identified barrier cited was the ‘Attitude of Others’, which is in contrast to the practicalities that disabled people have typically identified as being the major barrier to participation in the past. 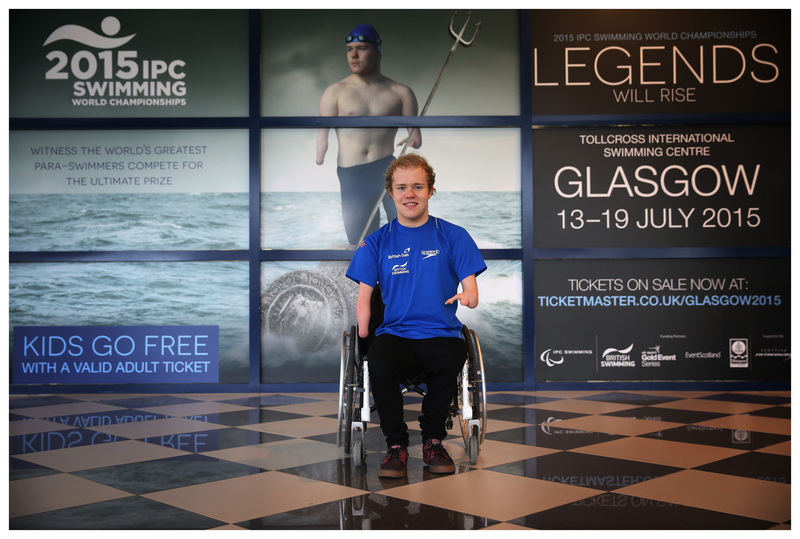 Although not every individual may aspire to perform at the level that we will see over the coming week, perhaps the excitement and live coverage of the event will not only inspire more disabled people to take part in swimming but also start to challenge some of the more negative attitudes that some people may hold about their participation in sport. The event will take place in the 50m pool at Tollcross International Swimming Centre which was the venue for the 2014 Commonwealth Games. Races will consist of swims in all four strokes (Freestyle, Backstroke, Breaststroke, Butterfly) and in the Individual Medley (IM: all four strokes in one race) across distances that range from 50 metres to 400 metres. Swimmers are classified according to their disability and compete in events alongside other competitors who have been evaluated as having a comparable level of impairment. How are the swimmers classified? All Paralympic sports involve a classification system to minimise the impact of impairments on the sport, in this case swimming. Having an impairment is not sufficient for classification, it has to be shown that there is an impact on the sport. Paralympic swimming caters for three impairment groups – physical, visual and intellectual and athletes compete in the same strokes as able-bodied swimmers namely Freestyle, Butterfly, Backstroke, Breaststroke and the Individual Medley (IM). The sport class names in Swimming consist of a prefix “S” (Freestyle, Butterfly and Backstroke events), “SM” (Individual Medley), or “SB” (Breaststroke) and a number. The prefixes stand for the event and the number indicates the sport class the swimmers competes in. The classification number indicates the impairment. Classification 1-10 involves some form of physical impairment, the lower the number the more severe limitation of the swimmer’s impairment. Classification 11-13 involve visual impairment, and 14 indicates an intellectual impairment where the swimmer has an IQ below 75. With a multitude of events, the scheduled appearance of many Paralympic stars, and several British medal hopes this competition looks set to be an exciting one! 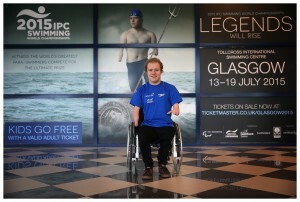 Follow the excitement of the event and the fortunes of the Team GB stars at http://www.paralympic.org/glasgow-2015. This entry was posted in Karen Howells, Uncategorized on July 10, 2015 by Karen Howells. Can Jamieson overcome adversity to compete at Rio? BBC Sport has recently reported on Olympic gold medallist David Wilkie’s predictions about the relative chances of Scottish swimmers Ross Murdoch and Michael Jamieson being selected for the British team for the 2016 Rio Olympics. Michael Jamison competed in London 2012 and was one of our few medal winners in the pool winning silver medal in the Men’s 200m breaststroke. However, he has seen a drop in form since then being beaten into silver in the Commonwealth Games by then relative newcomer Ross Murdoch and then failing to qualify for the World Championships this year. However, there has been some indication that Jamieson is heading in the right direction as he decisively beat Murdoch in the 200 breaststroke at the Scottish Nationals in Tollcross, Glasgow several weeks ago. He is currently ranked 28th in the world this year. Murdoch’s success has been somewhat more consistent, having won Gold at the Commonwealth Games, he qualified for the World Championships behind the world record holder in the 50m and 100m breaststroke, Adam Peaty. Wilkie is reported as saying that Jamieson will find it difficult to make the team and that “I think it mentally destroyed Michael for a while and he had to go away and take stock and work out where he wants to be. . . . He’s a class swimmer but he took a big mental hit”. Both swimmers have a hard task ahead of them – the 200m breaststroke is one of the most hotly contested events in British Swimming with a number of swimmers posting FINA A times in 2015 and being in with a real chance of GB team selection, their current world ranking as at 8 July 2015 is shown in the brackets: Adam Peaty (2), Andrew Willis (5), Craig Benson (10), Calum Tait (16) and James Wilby (25), all being in with a chance of qualifying for the two positions for Rio. So David Wilkie is probably right that Jamieson will struggle to make the team. However, this is possibly due to the high number of high quality world class breaststrokers that Great Britain has produced over the last few years, rather than the mental hit that Wilkie refers to. Academic research that I carried out as part of my PhD, suggests that the mental destruction (which could characterised as adversity) that Wilkie refers to may be in Jamieson’s favour rather than being a debilitating factor. In research that involved an analysis of Olympic Swimming Champion’s autobiographies (Howells and Fletcher, 2015), we identified that swimmers competing at the highest level experience (adversarial) growth following negotiation of adversity. Adversity was characterised as comprising developmental stressors (e.g., dyslexia), external stressors (e.g., organisational stressor), embodied states (e.g., injury), psychological states (e.g., body image concerns) and externalized behaviours (e.g., self-harm) and involved a threat to the individual’s identity as a world class swimmer. The growth that followed a transitional process, which included seeking meaning and the enlistment of social support, was characterised by enhanced relationships, increased spiritual awareness, prosocial behaviour, and importantly in the context of discussion about Michael Jamieson’s fortunes, superior performance. Furthermore, in a study of psychological resilience in Olympic champions, Fletcher and Sarkar (2012) found that “most of the participants argued that if they had not experienced certain types of stressors . . . including highly demanding adversities such as parental divorce, serious illness, and career-threatening injuries, they would not have won their gold medals” (p. 672). Maybe Jamieson can use the disappointment of the last two years to grow psychologically and achieve the superior performance that he needs to qualify for Rio next year. But even if he can he will be up against some of the world’s best breaststrokers just to qualify. Fletcher, D., & Sarkar, M. (2012). A grounded theory of psychological resilience in Olympic Champions. Psychology of Sport and Exercise, 13(5), 669-678. Howells, K., & Fletcher, D. (2015). Sink or Swim: Adversity- and Growth-Related Experiences in Olympic Swimming Champions. Psychology of Sport and Exercise, 16, 37-48. This entry was posted in Karen Howells, Uncategorized on July 8, 2015 by Karen Howells. I walked across a University campus last week following a sport psychology consultation with an elite athlete. As I walked, I reflected on how the session had gone and started thinking about some of the psychological skills we had been working on. This particular athlete was more inclined than others to be negative in his thinking. We had spent some time during that session focusing on the use of positive self-talk and the reframing and the countering some of his common examples of negative self-talk. The athlete had talked about the preparation for his race and explained that he worried about what might go wrong, that he may tire too early in the race, that he may false start, that he may fall behind his competitors, and that he was scared of disappointing his coach. We discussed the link between his thoughts and subsequent behaviours and started to counter some of his more irrational thoughts. For example, we talked about the number of times he had false started, which he admitted was none, and resolved that the concern had little value other than to create a negative state of mind and, more importantly perhaps, by focusing on false starts he was increasing the likelihood of them occurring. As I reached my office, I saw a sign scribbled hastily on the side of a cardboard box propped up against a railing . . . “Wet paint – do not touch” it said. The child inside me took over from the sport psychologist; it took all my willpower not to touch the railing, just to check. Was the paint really wet? Until that point I had not been aware of any desire to walk over to a random railing and touch it. Where did that urge come from? It made me think back to some other instances where I had noticed the ubiquitous use of the word NOT or DON’T when giving instructions. As part of a recent observation of a gymnast who was struggling with a ‘mental block’ on some of her moves, I noted that her coach told her: “don’t stand for too long”, and “don’t worry, you are not going to fall”. The effect on the gymnast was immediate and powerful. She paused before her move, looked at her feet, shuffled and paused again, and she looked frightened and concerned. In both of these examples the coach was effectively creating negative self-talk in the gymnast’s mind – she was thinking about standing for too long and was worrying about falling. It is possible that without the instructions the gymnast would have executed her move quickly without fear of falling. In swimming one of the habits that coaches detest is seeing their swimmers breathe on the first arm pull after a turn. I have heard many coaches bark at their swimmers: “don’t breathe out of your turn” and observed the swimmer nod dutifully and accordingly breathe on the very first stroke. The use these negatively framed statements is two-fold. On the one hand it primes the athlete to think negatively, to worry about making a mistake, and it does little to assist the athlete in identifying the correct desirable behaviour. So, as good practice coaches should try to frame their coaching instructions in a positive manner; tell your athlete what you want them to rather than what you don’t want them to do. In the examples that I have come across, the gymnastics coach could have encouraged her athlete to “start your move as soon as your feet are in place”, and “you are going to be steady and stick it”, and the swimming coach could have encouraged “three strokes before you breathe after each turn!” Using these positively framed instructions as opposed to the negatively framed statements will start to encourage positive thinking and to reinforce the desired behaviours in athletes. And whatever you do, don’t think about the pink elephant. This entry was posted in Karen Howells, sport psychology on July 8, 2015 by Karen Howells. On Saturday night, England played a phenomenal game to beat Germany for the bronze medal at the FIFA Women’s World Cup 2015. Members of the team played with confidence, but the odds were psychologically against them after suffering such a cruel defeat to Japan earlier in the week, never mind the fact that they had never beaten Germany before. In psychological terms, resilience is a process that involves coping with challenges and experiences of significant adversity in different contexts. This evolves into particularly individual ways of viewing of the world. The process of adapting well in the face of adversity, trauma, tragedy, threats, or even significant sources of stress – such as family and relationship problems, serious health problems, or workplace and financial stressors. It means ‘bouncing back’ from difficult experiences. In a group context, adapting to unpleasant experiences (for example, losing a game from an own goal in the dying minutes) is central to performing well in a team. With this in mind, let’s look at the resilience of the England players. Fara Williams grew up on an estate in Battersea, had a difficult upbringing and was homeless for seven years from the age of 17, while playing for England. Karen Carney came back from injury, depression and self-harm. Fran Kirby has spoken honestly about her struggle to come to terms with her mother’s death, her battle against depression and her fierce return to Reading, scoring 33 goals in her first season back. Katie Chapman is a mother of two, Casey Stoney came out in 2014 and suffered homophobic abuse on social media. At 26, Claire Rafferty suffered three anterior cruciate ligament ruptures and also works as an analyst for Deutsche Bank. Each of these journeys is personal, but a combination of factors contribute to team resilience. Many studies show that the primary factor in resilience is having caring and supportive relationships within and outside the family that offer encouragement and reassurance. There is no doubt that it is possible for this to be found in a sporting team environment. Together the team showed perseverance and trust in the ability of individuals, but also in their team’s ability and in the ability of the group of coaches, physiotherapists and psychologists. It is part of sport for athletes to make mistakes, as Laura Bassett did in scoring the own goal at the end of the semi-final against Japan. But many argue that resilience is key to overcoming mistakes in sport. A player who is not resilient will tend to mull over the mistake and it will affect their performance. A resilient player will use of the mistake as an opportunity to learn. Everyone appeared to be heartbroken after the cruel ending of the semi-final game against Japan, but the team rallied round Bassett to bolster her resilience. After the game, coach Mark Sampson said: “It’s ok to cry”. Being permitted to experience strong emotions (as well as recognising when you may need to avoid experiencing them) is important in recovering from an upsetting experience. It was evident from the start that captain Steph Houghton was going to play her part in picking up the team to play formidably against Germany. Laura Bassett reflected on how hard it will be to move on from her own-goal heartache, but she captured the nation again by opening up, facing this head on and getting back on the pitch. Teaching athletes to acknowledge, review and strategise after a defeat allows them to manage the emotional response which comes with making mistakes. Often, the most successful are those who have failed the most and after 21 attempts to beat Germany, it was England’s moment to finally claim victory. Helen Owton is Lecturer in Sport & Fitness at The Open University. This entry was posted in Helen Owton, psychology, sport psychology, Women's Football World Cup 2015 on July 7, 2015 by Caroline Heaney. So how well do you know your sport? Can you answer these three questions? What event is the second largest multisport Games in the world after the Olympics? At what event have 48% of all recent medallists at the Olympic Games, including Beth Tweddle, Jessica Ennis-Hill, and Michael Jamieson medalled at? What event is taking place in Gwangju, Korea between 3 and 14 July 2015? If you don’t know the answer to these questions, then you may not be aware that the Summer Universiade, or the World University Games as it is more commonly known, is currently underway in Gwangju, Korea, and will run until the 14 July 2015. The World University Games is held every two years for student athletes and this year between 12,000 and 13,000 athletes from 141 countries are competing for medals in 21 different sports. Sixty-seven athletes from Great Britain and Northern Ireland have travelled to Korea to compete across 12 different sports to attempt to improve on the medal haul from the 2013 Games held in Kazan, Russia when Great Britain took home 1 gold, 1 silver and 4 bronzes. Many of the events are already underway and by day five GB has already surpassed its success from two years ago and currently sits in ninth position in the medal table with 2 golds, 2 silvers and 1 bronze. Medals have already been won in the Artistic Gymnastics (Kelly-Jay Simm, Women’s Individual All-Around, GOLD), and in the Swimming (Jay Lelliot, Mens 400m Freestyle, GOLD, Men’s 800m Freestyle, SILVER; James Wilby, Men’s 100m Breaststroke, SILVER; Craig Benson, Men’s 100m Breaststroke, BRONZE). Kelly-Jay Simm is also in with a good chance of more medals as she competes today in the final of the vault, the uneven bars, and the floor exercise. Hopes are high for more medals in the pool as Craig Benson goes into the 200m Breaststroke later today (Tuesday 7 July) with the fastest qualifying time from the semi-finals. He is joined in that final by fellow Scot Calum Tait. A positive start is likely to have filled Team GBR with confidence as more sports start over the coming days. Follow the medal successes of the team via the British Universities and Colleges Sport (BUCS) and the Games websites. This entry was posted in Karen Howells, Uncategorized on July 7, 2015 by Karen Howells. Where have all the teenage tennis prodigies gone? Over the years tennis has seen many teenage stars grace the courts and defeat their more senior competitors. One of the youngest teenage tennis prodigies was Jennifer Capriati who turned professional and had attained top 10 status by the age of 14 in 1990. However following her successful teenage years of tennis Capriati experienced many issues away from the court and ended up taking a year out of the game in 1995. Following this she resumed her career and won three grand slam titles before retiring in 2005. Martina Hingis also reached great heights at a young age becoming the youngest ever player to win a match in a grand slam at 14 and at 15 the youngest player to ever win at Wimbledon in 1997. Injury forced her to retire at the age of 22. For both of these cases one must surely question the physiological and psychological implications of achieving excellence at such as young age. Monica Seles and of course Serena and Venus Williams also spring to mind when thinking of teenage tennis prodigies, all of whom specialised in tennis from a very young age. However it would appear that teenage prodigies are few and far between in the modern game and in Wimbledon this year 18 year old Belinda Bencic and 17 year old Ana Konjuh are the youngest top ranked players to watch. This decrease in the number of teenage prodigies hitting the top world rankings is also replicated, possibly even more so, in the men’s game. In the past we have seen Boris Becker win Wimbledon at the age of 17 in 1985 and Michael Chang taking the title at Roland Garros aged 17 in 1989, with other teenage stars such as Bjorn Borg and Rafael Nadal winning Grand Slams under the age of 20. However top ranked male tennis players under the age of 20 are becoming rarer in the modern era and this year Borna Coric aged 18, is currently ranked at 40 but failed to take his Wimbledon journey any further after losing to Andreas Seppi in the second round. The age at which children should ‘specialise’ in one sport is always a discussion point and early specialisation has frequently been fuelled by Eriscsson’s 10,000 hour rule with early specialisation in one sport being reported as the only way to accrue this amount of practice and achieve expertise. With the majority of research on 10,000 hours conducted outside of the sports domain Ericsson’s theory has received some criticism within sports research with the majority of studies concluding that early specialisation is not an essential part of elite athlete development. Instead sports can be classified as either early specialisation or late specialisation sports which is dictated by the age at which peak performance is typically attained. Those sports classified as early specialisation sports include diving, figure skating, and gymnastics where early sport-specific training around the age of 5 to 7 is traditionally seen as the route to achieving excellence. Late specialisation sports consist of all other sports including racket sports, where there is no advantage at specialising in just one sport at an early age. Back in 1988 Carlson investigated the development of 10 elite tennis players in Sweden and remarkably found that non-experts engaged in more tennis during early adolescence than the expert group. The results showed that the non-experts specialized in tennis by age 11, while the experts did not specialize until age 14, concluding that ‘early life specialisation did not benefit the development of elite tennis players’. So is the current lack of teenage prodigies due to the combination of evidence and common sense prevailing and young tennis stars being encouraged to sample a range of sports and specialise in tennis at a later age? Interestingly this shift at the top does not appear to be preventing early specialisation from occurring. A study of 519 US Tennis Association junior tennis players found that 70% began specializing at an average age of 10.4 years old. There are also reports in the media of young child prodigies such as Jonah Ziff who appeared in national papers aged 2, 8 year old Diego Quispe-Kim and 9 year old Gabby Price. Of the young Wimbledon stars this year Bencic remembers playing tennis at the age of two with her her father (and coach) and at just 4 years old began training at the Melanie Molitor tennis school. Ana Konjuh started playing tennis at 5 years old and left home at the age of 10 to develop her tennis career. Borna Coric also started playing tennis at age 5. So in Wimbledon this year we have a few examples of early specialisers that have managed to break through and it will be interesting to see the path that their careers take as a result of such early specialisation. However the question remains as to what is happening to the rest of our young tennis stars? Assessing the evidence there would appear to be two possible answers to this question. The first explanation attributes the lack of youngsters at the top of the sport to the increased speed and strength of the modern game whereby players, particularly in the men’s game, need to be physically mature to be able to cope with the demands of the game. In addition careers are now lengthier with improved training methods and advancing sports science knowledge keeping players injury free and physically and mentally match-fit for longer. The second conceivable answer is that intense specialisation at an early age is having a detrimental effect on the performance of young tennis players and may even be causing young tennis stars to burnout and dropout before they reach their peak performance age. Studies show that youth sport is becoming increasingly competitive which in turn has led to children taking part in extensive training, specialising in one sport at a young age, and playing large numbers of competitions at young ages. The result of this is an increasing occurrence of overuse injuries and burnout. John O’Sullivan author of ‘Changing the Game’ reveals in the US that a shocking 70% of children drop out of sport by the age of 13! So whether it is due to the increasing demands of the current game creating a longer road to the top or the fact that tennis continues to encourage early specialisation at the risk of future champions losing motivation and burning out or withdrawing from the sport, either way it is highly unlikely that the pattern of teenage champions as young as Hingis, Becker and Capriati will repeat itself any time soon. This entry was posted in E314, Jessica Pinchbeck, sociology, Wimbledon on July 6, 2015 by Jessica Pinchbeck. Despite, England’s devastating loss against Japan (and I haven’t quite recovered from their cruel defeat), the nation’s eyes and attention now fall on the people who were partly responsible for the England’s Women’s Football Team success and impelled them into the semi-finals. In the lead up to the Women’s FIFA World Cup, Mark Sampson was subjected to criticism (e.g. playing too defensively, selecting the right team) and he has had to prove himself during these few weeks. Not only does he have to prove his coaching, but he has had to be careful not to take all the credit for the women’s success. This isn’t just about football. Indeed Owen Jones argues that “men must embrace feminism, but not steal it” and Mark has given a lot of credit to the ‘England Heroes’ and his right hand person and England Assistant Coach, Marianne Spacey; it’s good to see women and men working dynamically and collaborating in their coaching roles behind the scenes to enable this success. Nonetheless, none of this changes the fact that there are so few women coaches, managers and officials in football, not only in the men’s game, but in the women’s game as well with just a global percentage of 7% of women coaching in football. Additionally, men hold 97% of European coaching licences and only 65 women hold a UEFA Pro Licence compared to 9,387 men. Whilst more men are helping to progress the growth of the women’s football game and the viewing figures stormed to a peak audience of 2.4 million in the U.K. during the semi-final game between Japan and England, let’s not forget that the liberation of women is down to women and this is the same in football. The strides behind the scenes have been down to the struggle and sacrifice of women in football. Helena Costa was the first female to coach a professional men’s football team, Clermont Foot but she resigned on the first day of her job. We don’t know the reason why she resigned but there has been some speculation and it might well involve a gendered argument particularly given the undercurrent of sexism that troubles football. In fact, there appears to be very few high profile examples of women coaching men in the whole of sport in the U.K.; Amelie Mauresmo coaching Andy Murray in tennis; Giselle Mather (Britain’s most prominent female full-time professional rugby coach at London Irish);Margot Wells coached husband, Allan Wells and is now an elite sprint and fitness coach working with members of the England Rugby Team; Mel Marshall was named Swimming Coaches Association Coach of the year in 2014 after Adam Peaty’s success – seven Commonwealth and European medals and two world records. They all seem to prove their critics wrong. Recently, Murray has been angered by comments about his female coach but if he wins Wimbledon even more strides will be made for female coaches. Murray says that working with a female coach has meant that he’s been able to talk more openly and he argues in an article for L’equipe that ‘It’s a crying shame there aren’t more female coaches’. Tennis appears to be one of the more progressive sports for women with equal pay and mixed doubles, but prevailing gender norms are still reinforced. Once again, these progressions have been down to the struggle and sacrifice of women, particularly one woman in: Billie Jean King who has relentlessly fought for equality in professional tennis. These few examples of successful women coaches show that although they are in the minority, when they do get the chance they make a big impact. It is evident that women are powerful influencers both as individuals, coaches, collaborators and enforcers of change in the world of sport. Sport is unquestionably missing out on something dynamic and influential if they do not have women involved and they have obviously started to realise this. Whilst initiatives are being created to include more women in coaching, women also need to be situated in more powerful positions (e.g. Executive committees) to challenge cultural attitudes that still need to change so that both women and men do not have to put up with sexism from the public, from organisations and sexist coverage that puts women off working in particular sporting fields and makes their job harder. The criticism women referees have received at this FIFA World Cup means that these initiatives would also improve the standard of refereeing at future International football tournaments as well, but we must remember that women are frequently subjected to harsh criticism when working in male-dominated roles. We are taking the right steps forward to challenge this undercurrent flow of sexism but we still have a long way to go before women coach men in premiership leagues. We may be lost for words after England’s defeat in the semi-finals against Japan, but let’s keep the dialogue going about women’s position in football so that the next Women’s World Cup is not played on artificial turf. This entry was posted in E314, Equality, Gender, Helen Owton, Women's Football World Cup 2015 and tagged Coaching, leadership on July 2, 2015 by Helen Owton.